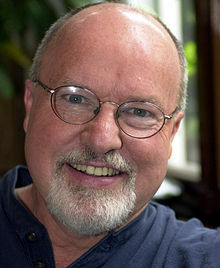 I follow Franciscan Richard Rohr’s daily meditation that he posts every day from the Center for Action and Contemplation in New Mexico. This week, Father Rohr focused on “Myth, Art and Poetry.” He concludes each week’s meditation with a summary on Saturday morning that includes a ‘practice’ to encourage and help travelers like me to better understand the week’s thoughts and to incorporate them into our daily lives if that is what we choose to do. 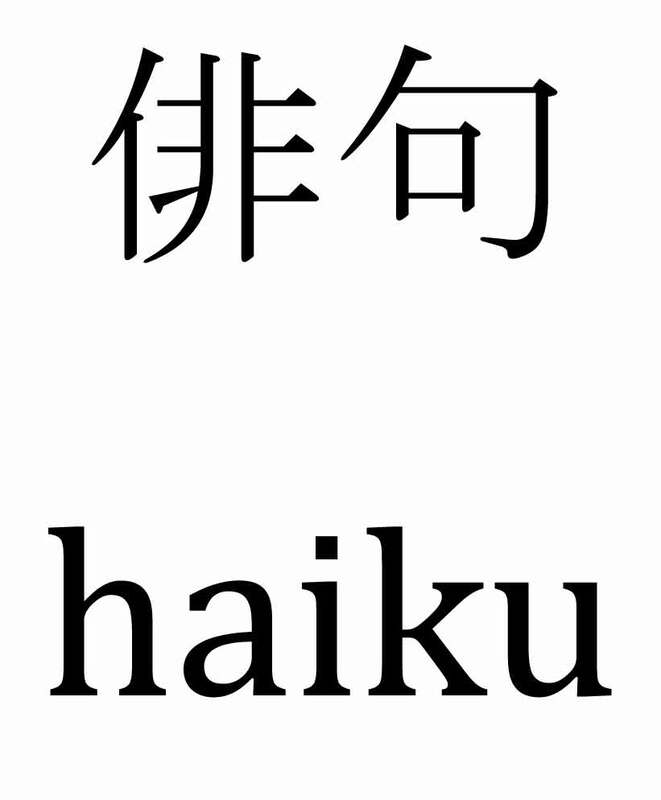 This week’s ‘practice’ is Haiku. From Richard Rohr’s daily meditation on Myth, Art and Poetry …. “In The Cloister Walk, Kathleen Norris writes, “Poets understand that they do not know what they mean, and that is their strength. . . . Writing teaches us to recognize when we have reached the limits of language, and our knowing, and are dependent on our senses to ‘know’ for us.” Haiku is a short form of Japanese insight poetry, a simple way of communing with nature. As with writing and reading other poetry, haiku can open the heart and mind to non-dual consciousness and to immediate encounter with Presence. “Creating haiku requires discipline and conciseness, focusing on just a single moment or movement and a couple juxtaposing elements. A haiku is a little sliver of concentrated reality. There’s no room for parenthetical, extraneous material–all the if’s, and’s and but’s. You must leave space for the imagination to fill in the gaps. “I invite you to try writing a haiku as a way of being intimately present to reality. Don’t worry about making a perfect poem or following the rules. 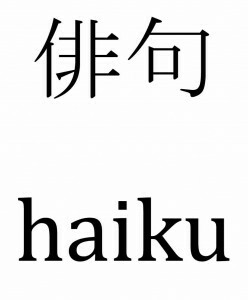 Many English haiku poems consist of 17 syllables in three phrases of 5, 7, and 5 syllables. But however the words emerge, let the process of creating the poem break you open to a deeper knowing, beyond definition and description to experience. “Find somewhere you can sit undisturbed while paying close attention to something in nature–a flower, tree, sunrise, rock, rain. Observe the object without words or analysis. Experience being here, in this moment, in this space. Listen for the essence of being, communicated wordlessly to you. I invite you to share your Haiku with Xy and me on this website. Before I wrote a single word to any of my books, I had a core concept clearly in my mind: what is this book about? 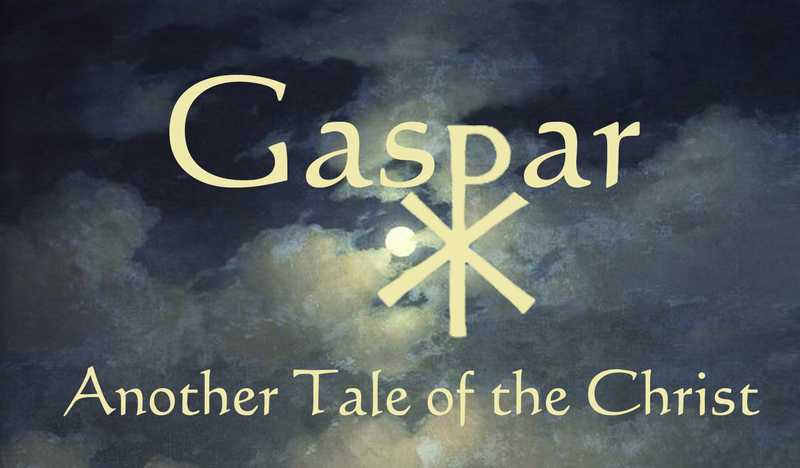 In the case of Gaspar, Another Tale of the Christ, I began – and finished – with the conviction that truth is universal, it is the same in the east as it is in the west. “I have learned what I have known all along. Truth is love and love is truth. A man can love himself. A man must love himself and a man must love all men on the earth as he loves himself. That is truth, Gaspar. There are seven directions and it is true no matter which direction you choose to follow. I was inundated this week with the Perennial Philosophy. Four years ago on my Vitruvian Man website, I wrote a post entitled Confluence of Faith, Aldous Huxley and Ruth. It was about the Perennial Philosophy, man’s continual search for truth. This week at Mass, we heard the beautiful story of Ruth throughout the week. It reminded me of that post and drew me back to the Perennial Philosophy and my belief that truth is universal. This larger and constantly recurring wisdom has been called the Perennial Tradition or the Perennial Philosophy. No one group owns this content, but most of us own parts of it, and for me the goal is to honor and include as many parts as I can, so that I can be truly catholic. We see this same inclusivity in Jesus to an amazing degree. I see this as the clearest indication that one practices “the true religion.” A true religion is precisely one that can teach you how to recognize and honor God everywhere, and not just inside your own group symbols. For those of you who have read Gaspar, Another Tale of the Christ, I hope this message came through to you loud and clear. 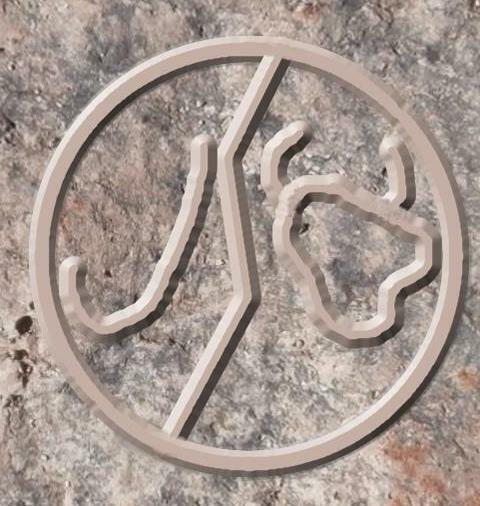 For those of you who have not yet entered its pages, I invite you to delve into it and the Perennial Philosophy that will indeed make this world a better place to be. I spent two years writing my story of a man’s search for truth, published in August as Gaspar, Another Tale of the Christ. If someone told me, “You have never had an original idea,” I would agree with her. Ideas are like stories and songs and paintings … they have always existed. They float around somewhere waiting for people to pull the thoughts together that already exist and to share them with other people in words, notes and paint. I love books. One year ago, my friend Father Charlie asked me if I would do the book purchasing at the Redemptorist Renewal Center’s bookstore. I answered with an enthusiastic ‘Yes!’ The only thing I can think of that is better than being surrounded by books is to be surrounded by puppies. I have introduced some new books into the Children’s shelf. Traditionally, it was stocked with books about Jesus, Mary and Joseph, the Saints and Bible stories. That is good. Still, I believe God inspires writers to tell stories to children beyond ‘Bible’ stories, stories that are easy to read that carry valuable lessons for young people. With that thought in mind, we’ve expanded the Children’s shelf to include other spiritual books like God’s Dream by Desmond Tutu, The Tiny King by Taro Miura and The Three Questions by John Muth. They have sold well. My idea to include books like this was validated this morning as I read Franciscan Father Richard Rohr’s summary of his weekly meditations. Fra Rohr by the way is the most popular author in the bookstore. We sell more Rohr books that any other author and by a significant margin. One of the books on our children’s shelf is Old Turtle by Douglas Wood. 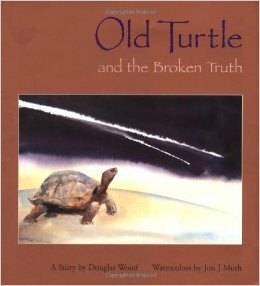 Mr. Wood followed with a sequel titled Old Turtle and the Broken Truth. Fra Rohr uses the story this morning to sum up his weeklong message on ‘Oneing,’ God’s plan to create unity out of multiplicity. His summary of the Old Turtle story is so perfect, I’ve decided to pass it on. I know you will enjoy it as much as I do. I hope it encourages you to purchase this beautiful book for someone you love. A wonderful children’s book, Old Turtle and the Broken Truth, written by Douglas Wood with watercolor illustrations by Jon J. Muth, tells an imaginary story of how the world came to be so fragmented when it is meant to be whole and how we might put it back together again. In a far-away land that “is somehow not so far away,” one night a truth falls from the stars. And as it falls, it breaks into two pieces—one piece blazes off through the sky and the other falls straight to the ground. One day a man stumbles upon the gravity-drawn truth and finds carved on it the words, “You are loved.” It makes him feel good, so he keeps it and shares it with the people in his tribe. The thing sparkles and makes the people who have it feel warm and happy. It becomes their most prized possession, and they call it “The Truth.” Those who have the truth grow afraid of those who don’t have it, who are different than they are. And those who don’t have it covet it. Soon people are fighting wars over the small truth, trying to capture it for themselves. A little girl who is troubled by the growing violence, greed, and destruction in her once peaceful world goes on a journey—through the Mountains of Imagining, the River of Wondering Why, and the Forest of Finding Out—to speak with Old Turtle, the wise counselor. 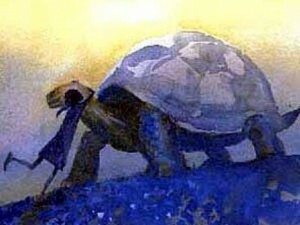 Old Turtle tells her that the Truth is broken and missing a piece, a piece that shot off in the night sky so long ago. Together they search for it, and when they find it the little girl puts the jagged piece in her pocket and returns to her people. She tries to explain, but no one will listen or understand. Finally a raven flies the broken truth to the top of a tower where the other piece has been ensconced for safety, and the rejoined pieces shine their full message: “You are loved / and so are they.” And the people begin to comprehend. And the earth begins to heal. Is our vendor carrying a large quantity — if he is, it means the book is selling. How is it doing on Amazon — certainly not the end-all indicator, but it is worth a look. The vendor was carrying a ‘substantial’ quantity at their site, the ‘secondary’ site, which I have figured out is where they store all independent and self-published books. It was doing ‘OK’ on Amazon. Having played the game, if an author is under a million, he or she is at least in the top 20% of books sold. As I researched her book, she told me how most people don’t understand how difficult it is to write a book. That stopped me in my tracks. I think I set her back on her heels, unintentionally. In the final analysis, I told her — and I did — I would order several copies from our vendor for our shelves. She was most appreciative. Here’s one of the greatest compliments I have received in recent years …. A lady was passing by the ‘new book’ display and picked up Fra Rohr’s latest offering Silent Compassion. “That’s his latest book,” I commented. That led to a lengthy conversation. She bought the book. Before she left the store, she said to me, “You remind me of the old booksellers — she was 75 if she was a day. When you see someone looking at a book, you can lead them down the road to other books.” That made my day.